Having mentioned Mungo Lodge in her last article for Airplanista, Kathy Mexted decided to go and check it out for herself. 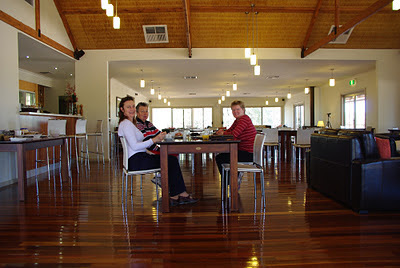 She found a great airstrip, beautiful accommodation and the best roast duck in Australia. It’s 6.30am on a late September morning. The Australian spring is underway, and from the wide deck of my room at the Mungo Lodge, I am watching the sunrise across the red soil of the Australian bush. Shards of pink and purple shoot across the low level cloud and cast a soft glow on the wing of the Bonanza parked about 50 meters away. A cool breeze rustles through the eucalyptus trees and a few of the early birds continue warbling, perhaps content with their catch. This place is ruggedly beautiful, and having overflown it about 13 years ago, I have always wanted to return and stay. This year I’m getting reacquainted with my flying past, and to gain currency I’ve gathered three friends – a commercial pilot and two earthlings -- for a quick outback hit. Perhaps now one of the most appealing things is that the airstrip is only 100 meters from the 4 star restaurant! World Heritage Listed Lake Mungo has been dry for over 15,000 years. 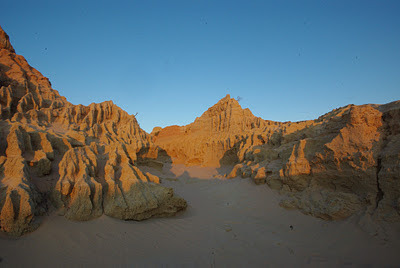 Since the discovery of the 40,000 year old human remains of “Mungo Woman” in 1968 and “Mungo Man” in 1974, the location has been established as one of Australia’s most important archaeological sites. The eastern side of Lake Mungo has a 29km long wall of sand, “The Great Wall of China” which is moved by the wind about 1-3 meters eastwards every year. With the enormous rain event last southern summer, deep gullies up to 8 feet high and 4 feet wide formed in some parts of the wall. 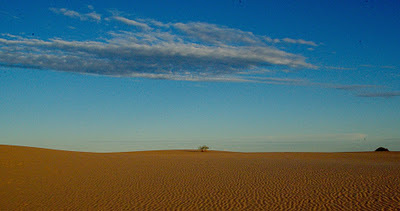 It has also set the desert alive with flowers and vegetation and washed up new fossils and artifacts. The Lake and its environs are National Park, and include an extensive visitors centre and a beautiful historic shearing shed. The jewel in the crown of this location is the Lake Mungo Guest Lodge, which is owned by Indigenous Business Australia (IBA). The Lodge celebrates its 20th birthday this November, and only three years ago had a complete makeover. With its high-pitched roof, highly polished spotted gum floors, open fireplace, bar, and outdoor dining deck, there is little to deter the weary traveler from settling in. In fact, I could have stayed a lot longer! 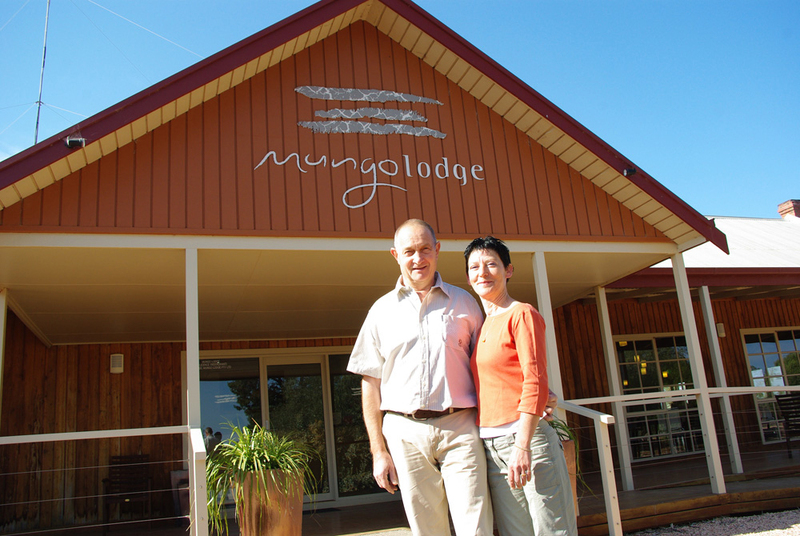 In a stroke of luck, the managers are a French couple, Jacques and Catherine Barichard, who had already fallen in love with Australia and its outback by the time they visited Mungo in 2009. “I’d always wanted to come out to Mungo, and so I said to Catherine that we should go back to Australia for a holiday. We got here when the lodge had just reopened and there was a vacancy for a manager.” They’ve now been here for three years, building the business and garnering a strong reputation, not only for the standard of the accommodation, but the splinteringly great food. Jacques and Catherine brought with them the best of French hospitality and cuisine know-how and it quickly became obvious that not only were we in one of Australia’s best outback locations only 90 minutes north of Melbourne, we'd struck amazing chefs. While I drank in my roast duck, which was melting off the bone, we congratulated ourselves on this fantastic find. So, all this is great news for aviators. Jacques and Catherine are aviation enthusiasts, and welcomes pilots – on their own, in groups, staying for the week, or just passing through for lunch. And lunch is quite possible, because of the short flight time from Melbourne. Anybody flying in receives a 10% discount on accommodation. There has already been over 100 light planes arrive this year. 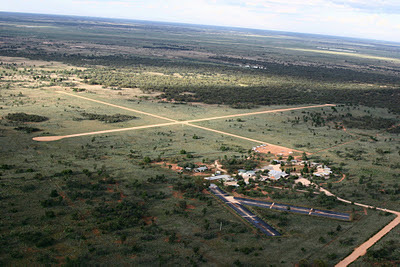 The 2009 makeover included a freshen-up on the airstrip as well. A cross strip was added, and from the air it was easy to spot the runways, each with a large pleasing turning circle at each end. The runways are maintained weekly. We sure had no trouble in the Bonanza, and taxied to the parking bay from where we walked about 100 meters across to the Lodge. By 3.30pm, a minivan had arrived and Lake Mungo’s version of Crocodile Dundee greeted us with a big broad outback smile. Trevor Hancock has been living and working in outback Australia for 40 years, and for ten years has run his unique tour company MurrayTrek 4wd Adventures. “Look out for the chooks,” he jibed as we slowed to allow a passing emu cross the road. (Chook is Australian slang for a chicken or rooster. The emu’s are quite a bit larger than a chook!) We toured the Great Wall of China, stopping to inspect artifacts and places of note, before settling down on the pink sands to take in the sunset. The dead flat views from the sand dunes stretch to the horizon, punctuated only by the occasional grazing kangaroo. The space and quiet is like a tonic for the soul, and it is these open skies, unpolluted by artificial light, that inspire stargazing at the Lodge. “Sometimes we turn off the lights at the Lodge and loan the guests our telescope and high powered binoculars to observe the billions of stars in the “Milky Way,” says Jacques. Not far from Mungo is the Darling River, and Trevor, a keen fisherman, enjoys taking visitors there. “I can cook the fish for them on the riverbank. I’ve got all the gear in my truck,” he enthused. “I can take groups or individuals for a picnic, paddle boat rides, bushwalking, sightseeing, whatever.” His last trip was up to Cape York in the far north reaches of Queenslands tropics, and by the time you read this he’ll have just returned from Western Australia. It seems there’s no part of Australia that’s too far flung, and while the distances seemed quite incredible to us aviators, Trevor shudders and says, “I’ve never been in a plane. I’m scared of flying.” I replied, “That’s ok. I’m scared of snakes. We’ll get on well.” But nobody was scared of birds, and as we settled in for dinner back at the Lodge, we eyed the telescope and the bird list. If you can entice the host to sit still for 20 minutes, he can give you a complete rundown of all the local birds splashing happily in the birdbaths under the freshly collected rainwater. The eco friendly Lodge aims for minimal environmental disturbance. Presumably the recycled water will be used to water the partially completed golf course. Jacques smiled as he discussed his folly, and pouring us a glass of local wine, we acknowledged the benefits of golf, but were secretly more excited at having a knowledgeable French man in charge of the wine list. 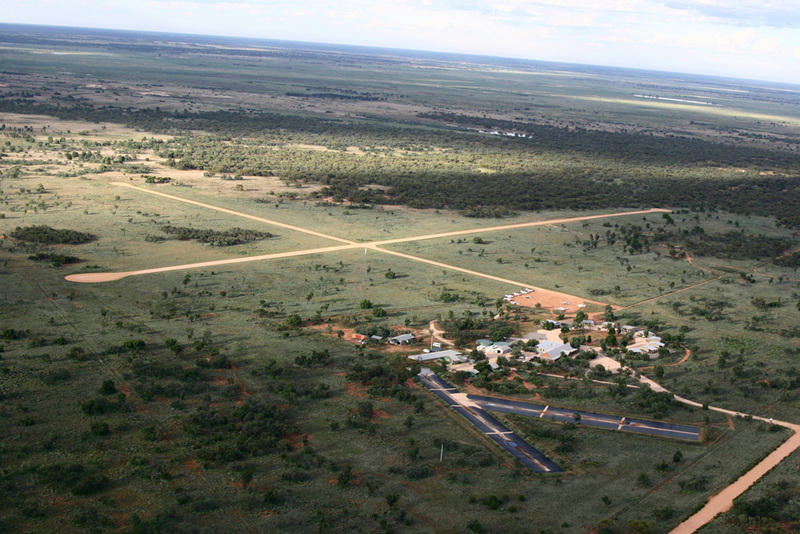 Although it was a revelation to me, Mungo Lodge has long been a favorite meeting place for Aussie aviators. It’s hoped that game will soon be on the menu, so by the time you get here they might be cooking ‘roo. Or is that a roux? The girls have just arrived back with my breakfast. The Bonanza is eyeing me from the strip. “Hurry up,” it says. “I’m coming,” I reply. 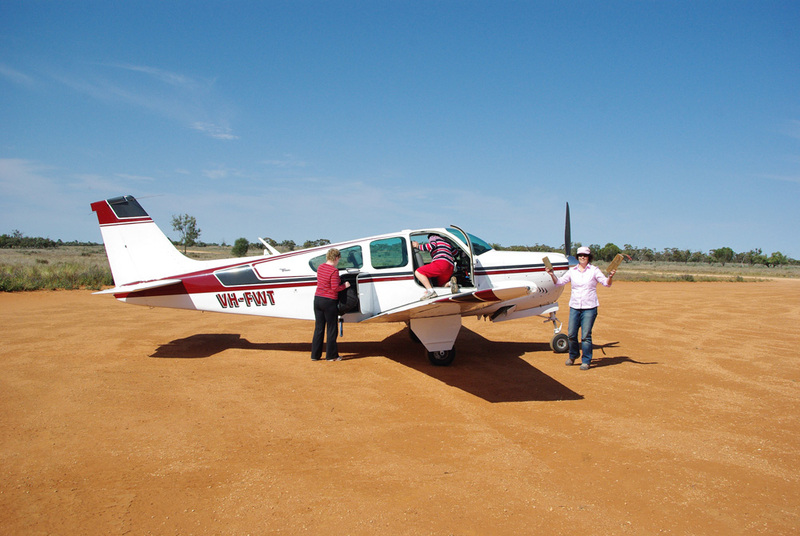 “Just let me finish my home-made freshly-cooked melt-in-the-mouth croissant.” There’s more to the Aussie outback than just red dirt, and some of it is easily accessible in an airplane. You can listen to Kathy's podcast on Plane Crazy Down Under about her outback trip to Lake Mungo and Wilpena Pound.